Contact us for more information about the on-line Listening Test for AIT. 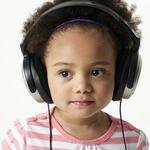 We Now Offers Am On-Line Listening Test! Testing can be done anywhere in the world, using a computer and headphones! Please note that Listening tests or audiograms are NOT required to AIT to be effective. We do not require testing for children with autism, those age of 6 and under, or those who can't cooperative to obtain a reliable audiogram or Listening Test results. Not all cases who can do testing will require any additional filters to be for AIT to be successful. The largest clinical study ever done on AIT for children with autism with 445 participants in 1994 done by the Autism Research Institute did not use listening test on this population. Do not be overly concerned if you are the parent of a child who is ineligible to perform these tests because they have autism, are under the age of five OR because they may have difficulty participating in the audio tests. The tests may provide information resulting in a tangible benchmark as to the effects of Berard AIT - but are not essential to its success! The ears must be in good health and must not have an active ear infection either just before or during AIT. This is important is there is any concern about recurrent infections, a history of several ear infections, fluid, wax, or ear drum and/or middle ear problems. Parents of children who have ear health issues should so use their best judgment for timing the ear health checks before AIT if there is a history of many past ear infections or possible symptoms of an active ear infection. The most significant information about an individual’s candidacy for Berard AIT is the participant’s unique, over-all history and current issues of behavior and learning. The most significant indicator of AIT efficacy is in the results that the participant experiences in every day life and learning in the days, weeks and months following AIT. Listening tests are NOT required for children age 6 and under or those with an Autism Spectrum Disorder (ASD or autism) diagnosis or suspected diagnosis to be effective. A listening test is only done if a Participant can reliably cooperate. The AIT Checklist comprises about 90% of the candidacy picture for AIT, with the listening tests is about 10%. In some cases there be extreme irregularity in the audiogram or Listening Test that add strongly to the candidacy picture in some cases, but more often the audiogram will show a milder variation. If children react strongly with hyper-defensiveness around their ears, obtaining good results with ear checks and tympanograms can be difficult or impossible and the results will not be reliable. Our new on-line AIT Listening Test is available for potential clients and clients. We provide is online access to candidates who have completed the AIT Checklist. The Listening Test must be performed in a sound quiet, but not a sound proof environment. This is done to gauge how the Participant hears in a more natural “real life” setting. The AIT Listening Test is a simple and subjective measure but requires accurate and consistent participant responses during the testing to be reliable. The Listening Test creates an audio graph that is a visual measurement of how the individual hears the ten (10) frequencies tested for Berard AIT at the time of the test. The Listening Test is straightforward and can be done in about 10 minutes. The Participant follows the written instructions and tests the ten (10) frequencies in both left and right ear and indicates awareness of each sound as instructed. The Listening Test checks the ten (10) frequencies of: 250Hz, 500Hz, 750Hz, 1000Hz, 1500Hz, 2000Hz, 3000Hz, 4000Hz, 6000Hz, 8000Hz. The Participant indicates awareness of each sound as instructed. After each ear is tested individually, an audio graph will provide a graphic display for the hearing of each ear. See a sample audio graph below. The Listening Test is a simple and subjective measure. It requires accurate and consistent participant responses during the testing. An emphasis can be placed upon testing for 750 Hz and up if the participant’s attention is not good, for example with younger children above age 7 and who are able to comply. The audio graph will how each ear (left and right) on a separate graph for careful evaluation for possible use of additional filters. Our Listening Test is used to help determine if additional frequency filters may be needed during the AIT sessions. Not all participants will need additional filters even if they are tested using the Listening Test. The main reason for additional filters is to increase the participant’s comfort level during AIT and/or to help mute the sounds that the participant is the most sensitive to, based on hyper-sensitive peaks in hearing. This filtering will also help to increase their results after AIT sessions. Filtering, if done, is selected by the AIT Practitioner and according to the Berard AIT protocol. Testing with our on-line Listening test is done before AIT and can also be repeated after AIT. Shifts seen in listening test are often accompanied by significant improvement in over-all comfort level, attention, and many improvements around behavior and learning that continue out for up to 6 months. A final Listening Test can be done after AIT is completed. This can help to document specific changes that have occurred during the AIT sessions, although changes will continue to occur over time. This Listening Test may also be repeated 3 to 6 months later as the person's listening skills can continue to shift over time. A post-AIT Listening Test can be done to check hearing over time and used as a base-line in the months and years after AIT. We usually will see a narrowing of the variability within each ear’s response after AIT and less variation between the two ear graphs. Audiograms or a Listening Test if done are ideally scheduled within 1 - 2 weeks prior to Berard AIT. The Audiogram or a Listening Test are NOT required for children with autism or under age 6 for AIT to be effective. We do not require or accept these tests results for those who cannot test reliably. Not every Participant tested needs additional filters for AIT; it depends on the listening test results. The audiogram measures the quietest tones that the participant can hear. The vertical line to the left of the graph shows the levels of sound that can be heard. Sound of the Tones: The quietest tones are at the top and the loudest tones are at the bottom. Pitch Tones: The lowest pitch tones are to the left and the higher pitch tones progress to the right. The horizontal line across the top of the graph shows each of the frequencies tested and include 250Hz, 500Hz, 750Hz, 1000Hz, 1500Hz, 2000Hz, 3000Hz, 4000Hz, 6000Hz, 8000Hz. 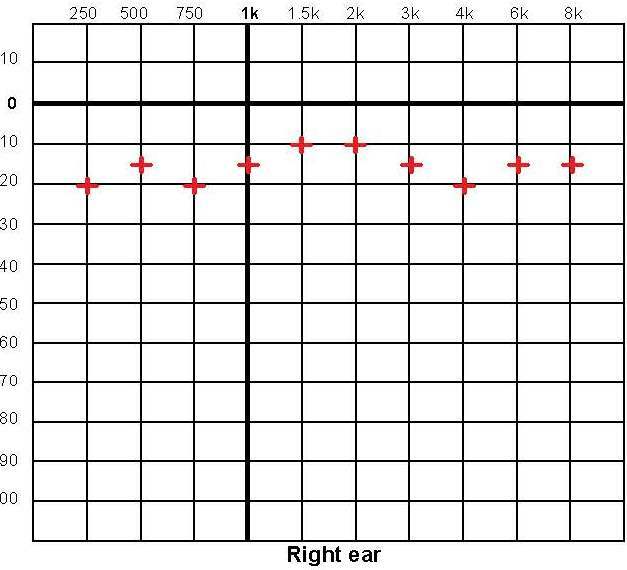 In a normal audiogram, we want to see a relatively flat line within the "0" to "20" range in both ears. This will indicate that both ears are hearing each frequency within a normal, comfortable range. Note: 6000 Hz wanders. 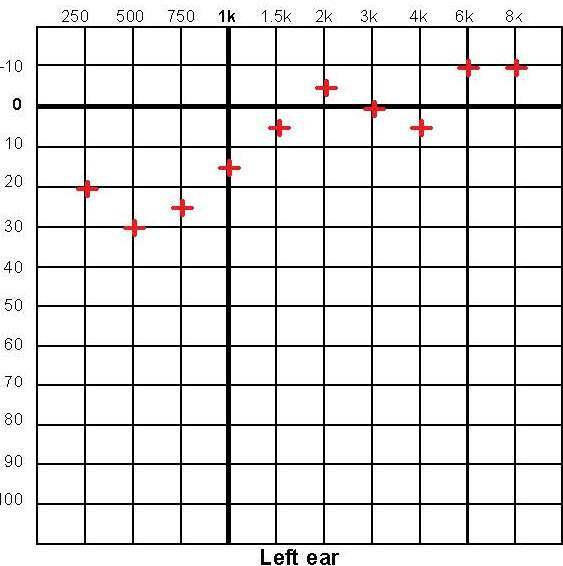 Coordination Between Ears: The audiogram pattern for each ear will indicate if the two ears are working in unison. If the pattern in each ear is different, then hearing may be distorted. Peaks in hearing between frequencies: These are shown in the negative range (upper portion of graph above "0" (including marks at -5 and -10) will show a level of hearing at a particular frequency that cannot be heard by the average person. Peaks In Hearing: Peaks in hearing will cause stress responses as well as difficulty attending, irritability, fatigue, hyperactivity and/or distractibility. Peaks in hearing can be very uncomfortable and/or make it difficult to processing the other sounds properly. They can also create a state of anxiety for the individual. Valleys in Hearing Between Frequencies: These are shown in the positive range (lower portion of graph, below "0"). Peaks and then a valley between frequencies can result in dramatic auditory processing deficits that effect not only auditory processing, but other brain and body dysfunctions. 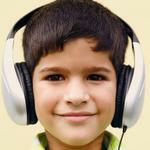 Hearing Loss: Hearing below 30 indicates potential hearing loss. If an obvious hearing loss is indicated by the audiological testing, a participant will not be a good candidate for AIT and should contact an audiologist for further testing and assessment. If a Participant is being tested by an audiologist for an AIT assessment, other audiological tests are also sometimes conducted along with the listening test, but these tests are not required for AIT. Other audiological tests are for: Laterality, Selectivity, Acoustical Reflex, Speech in Quiet and Noise and Auditory Speech Reception Threshold. An audiologist and/or medical practitioner can be used for ear health checks, doing audiograms, a tympanogram and for other tests listed. The correct Berard AIT protocol for obtaining an audiogram used with AIT must be followed and with testing at all ten (10) frequencies.